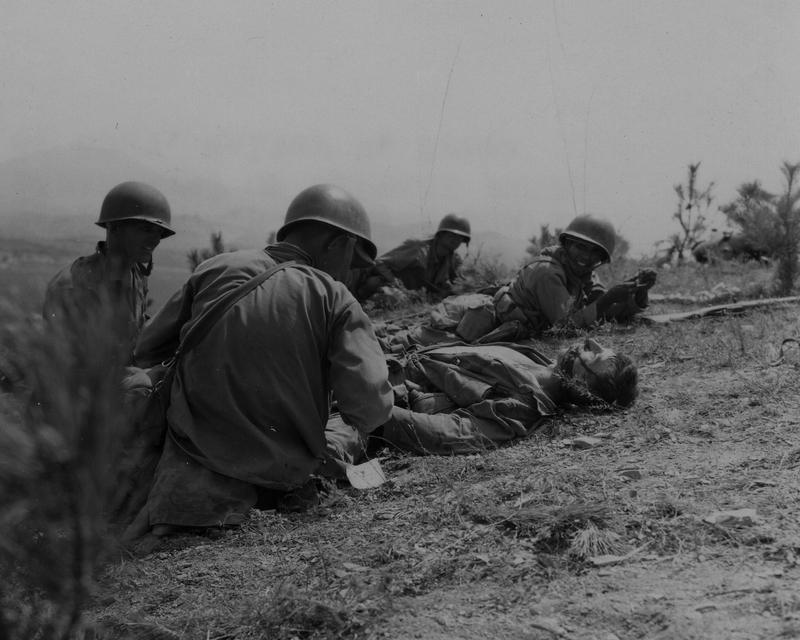 Corpsmen work on a wounded Marine during the 2nd Battle of the Naktong River, September 3, 1950. From the summer of 1950 through the end of the year, the Marine Corps endured one of its greatest crucibles in its history. Starting with the desperate fighting to hold Pusan after the North Koreans had unleashed their surprise offensive, through the stunning success of the Inchon Landing to the frozen shore of the Chosin Reservoir, the Marines who fought the 1950 campaign in Asia have been overlooked by historians and and American alike. 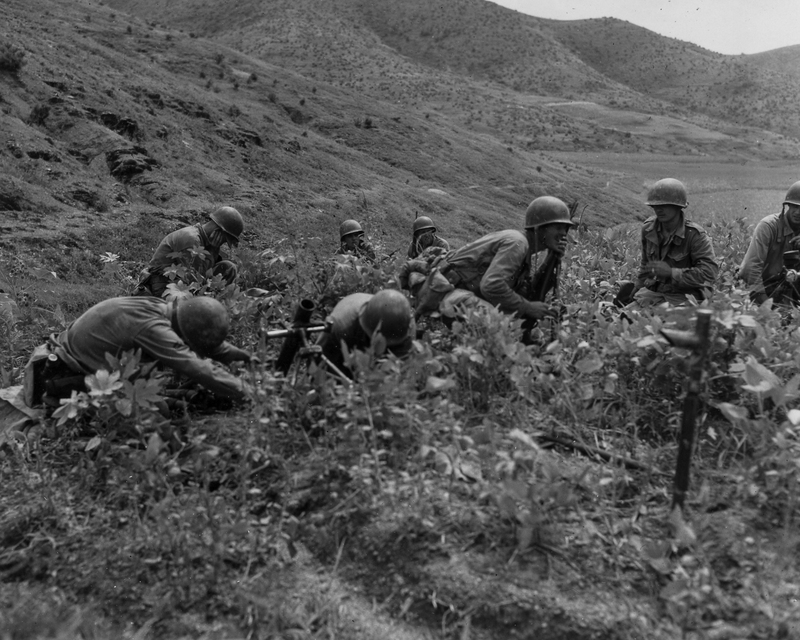 During the 2nd Battle of the Naktong Bulge in September 1950, the 1st Provisional Marine Brigade was thrown into line to blunt the last North Korean offensive of the summer. Fierce fighting followed that broke the back of the North Korean units around Pusan. A 60mm mortar platoon engaged along the Naktong, September 3, 1950. With hardly any respite, the 1st Provisional Marine Brigade was deactivated and its subordinate units folded into the freshly assembled 1st Marine Division. A week later, the men took part in the Inchon landing on the west coast of Korea. The success of that amphibious offensive crushed the North Korean Army, liberated Seoul and sent the Communist forces retreating for enclaves along the Yalu River. Men of the 1st Provisional Marine Brigade examine knocked out North Korean T-34 tanks during the 2nd Battle of the Naktong River, September 4, 1950. The 1st Marine Division was pulled out of the line and sent to execute another seaborne invasion, this time at Wonsan on the east coast of Korea. From there, the division drove north for the Yalu. In November, as the weather deteriorated, the Marines advanced slowly toward the Chosin Reservoir, establishing a series of supply dumps and securing airfields as they went. The 1st Marine Division commander, General Oliver Smith, believed the Chinese Army had intervened in force in North Korea, and was loathe to cut loose and drive for the Yalu with all possible haste as his Army corps commander, General Almond, kept demanding. On November 27, 1950, The 30,000 strong, reinforced 1st Marine Division was hit by the Chinese 9th Army and its ten division. The Chinese had been poorly equipped, having not even been issued winter clothing despite the fact that the temperatures had dropped to freezing levels. The Chinese Army also couldn’t supply and sustain its troops on the south side of the Yalu. They were not only suffering from exposure, but units were on the brink of starvation. As a result, the ten divisions could only count on 67,000 combat effectives when the offensive started. Despite the logistical problems the Chinese faced, their offensive against General Almond’s X Corps caught the Americans and UN troops by complete surprise. UN units were cut-off, surrounded and some wiped out. The Marines fought with unrivaled tenacity. Some units, despite being surrounded, held out against daunting odds, sustained by air resupply drops and air strikes while they faced wave after wave of Chinese attacks. Fox and Charlie Companies of the 7th Marines played a pivotal role in holding open the road south so two full regiments could escape the Chinese onslaught. Over the next two weeks, the 1st Marine Division was forced to fight its way back to the coast while under near-constant attack from the pursuing Chinese. Finally, on the evening of December 11, 1950, the last of the division reached the port of Hungnam, where a 193-ship task force evacuated all of X Corps over the following fourteen days. The 1st Marine Division, 30,000 strong at the start of the Chosin campaign, lost almost 4,400 men killed and wounded during the engagements with the Chinese. 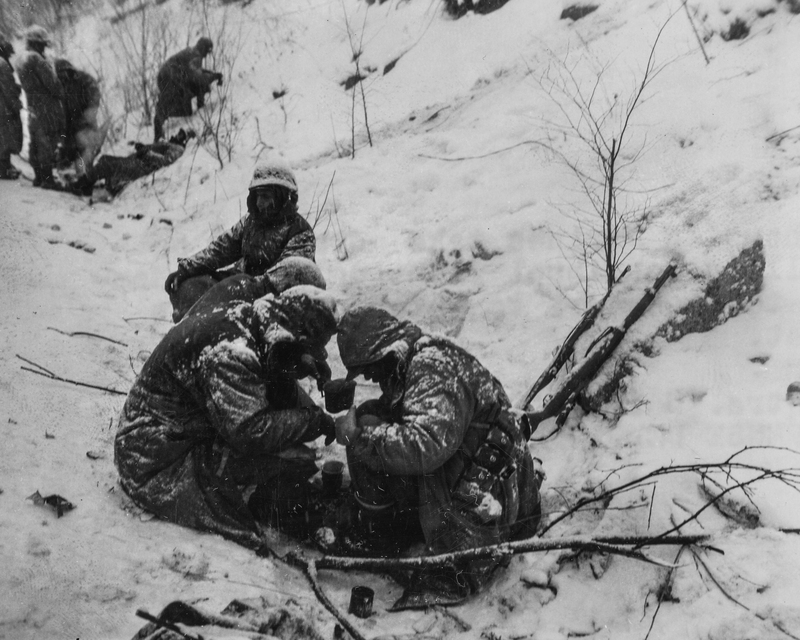 The brutal cold claimed another 7,300 men as non-combat casualties. Almost a third of the division had been lost in less than a month’s fighting. The attacking Chinese Army suffered almost 50,000 battle and non-combat casualties during the same period. As we spend the holidays with our families, please take a moment and give thanks to these brave young men who spent their Christmas season 65 years ago slogging along a frozen road in bitter cold, fighting an elusive and determined foe that gave no quarter. A 2/7 Corpsman at an aid station, November 3, 1950. Such bravery and dedication needs never to be forgotten. Thanks for reminding all of us through this post.